Use the following information to answer questions 1-4. 1. What is the overall balanced equation for this reaction? 2. What is the function of species B in this reaction? (A) Without it, no reaction would take place. (B) It is a reaction intermediate which facilitates the progress of the reaction. (C) It is a catalyst which changes the overall order of the reaction. 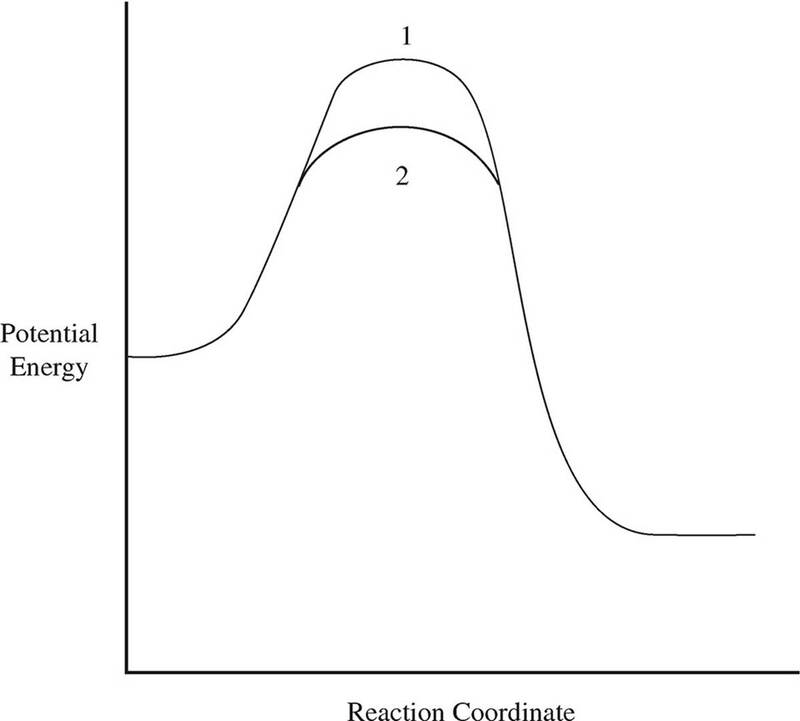 (D) It lowers the overall activation energy of the reaction. 3. If step II is the slow step for the reaction, what is the overall rate law? 4. Why would increasing the temperature make the reaction rate go up? (A) It is an endothermic reaction that needs an outside energy source to function. (B) The various molecules in the reactions will move faster and collide more often. (C) The overall activation energy of the reaction will be lowered. (D) A higher fraction of molecules will have the same activation energy. Under which conditions would the order of the above reaction double? (A) Doubling the initial concentration of A. (B) Doubling the initial concentration of B. (C) Reducing the concentration of A by half. (D) Changing the concentration of the reactants has no effect on reaction order. What are the potential units for the rate constant for the above reaction? Which of the following is the correct rate law for compete reaction? The reaction above takes place with all of the reactants and products in the gaseous phase. Which of the following is true of the relative rates of disappearance of the reactants and appearance of the products? (A) NO appears at twice the rate that NOCl disappears. (B) NO appears at the same rate that NOCl disappears. (C) NO appears at half the rate that NOCl disappears. (D) Cl2 appears at the same rate that NOCl disappears. If a mole of H2 gas is added to the reaction chamber, which of the following will be true? (A) The rate of reaction and the rate constant will increase. (B) The rate of reaction and the rate constant will not change. (C) The rate of reaction will increase and the rate constant will decrease. (D) The rate of reaction will increase and the rate constant will not change. If the temperature of the reaction chamber were increased, which of the following would be true? Based on the following experimental data, what is the rate law for the hypothetical reaction given above? 12. A solution of Co2+ ions appears red when viewed under white light. Which of the following statements is true about the solution? (A) A spectrophotometer set to the wavelength of red light would read a high absorbance. (B) If the solution is diluted, the amount of light reflected by the solution will decrease. (C) All light with a frequency that is lower than that of red light will be absorbed by it. (D) Electronic transmissions within the solution match the wavelength of red light. Reactant A underwent a decomposition reaction. The concentration of A was measured periodically and recorded in the chart above. Based on the data in the chart, which of the following is the rate law for the reaction? 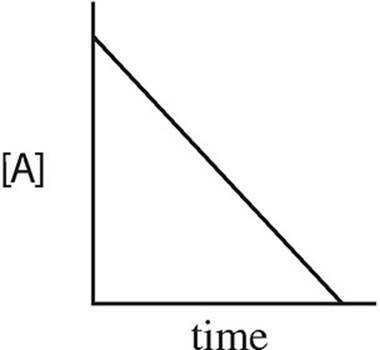 Which of the following graphs may have been created using data gathered from the above reaction? 16. After 44 minutes, a sample of is found to have decayed to 25 percent of the original amount present. What is the half-life of ? (a) Determine the order of the reaction with respect to each of the reactants, and write the rate law for the reaction. (b) Calculate the value of the rate constant, k, for the reaction. Include the units. 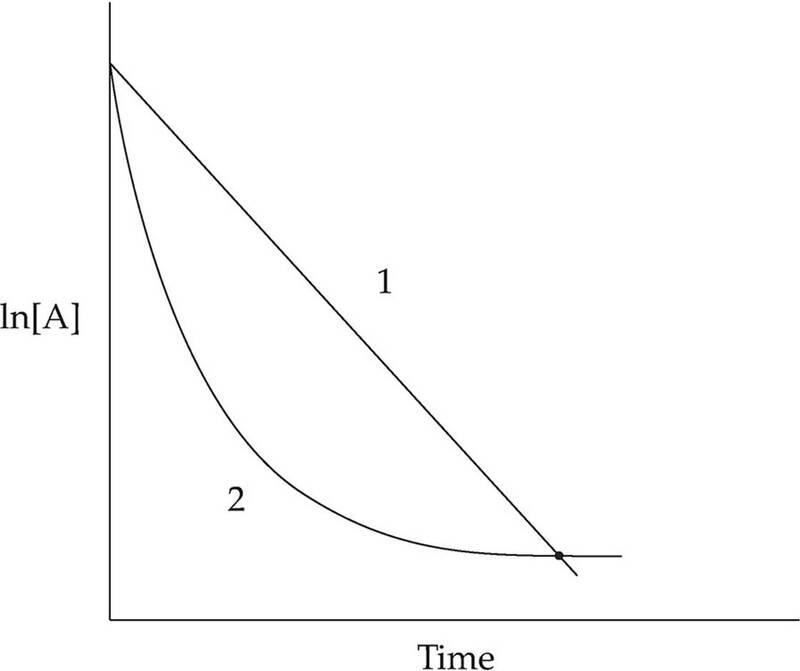 (c) If another experiment is attempted with [A] and [B], both 0.02-molar, what would be the initial rate of disappearance of A? (i) Show that the mechanism is consistent with the balanced reaction. (ii) Show which step is the rate-determining step, and explain your choice. (a) Write the rate law for the reaction. (c) In experiment 2, what was the concentration of NO remaining when half of the original amount of Br2 was consumed? (d) Which of the following reaction mechanisms is consistent with the rate law established in (a)? Explain your choice. Dinitrogen pentoxide gas decomposes according to the equation above. The first-order reaction was allowed to proceed at 40°C and the data below were collected. (a) Calculate the rate constant for the reaction using the values for concentration and time given in the table. Include units with your answer. (b) After how many minutes will [N2O5] be equal to 0.350 M? (c) What will be the concentration of N2O3 after 100 minutes have elapsed? (d) Calculate the initial rate of the reaction. Include units with your answer. (e) What is the half-life of the reaction? (a) (i) What order is this reaction? Why? 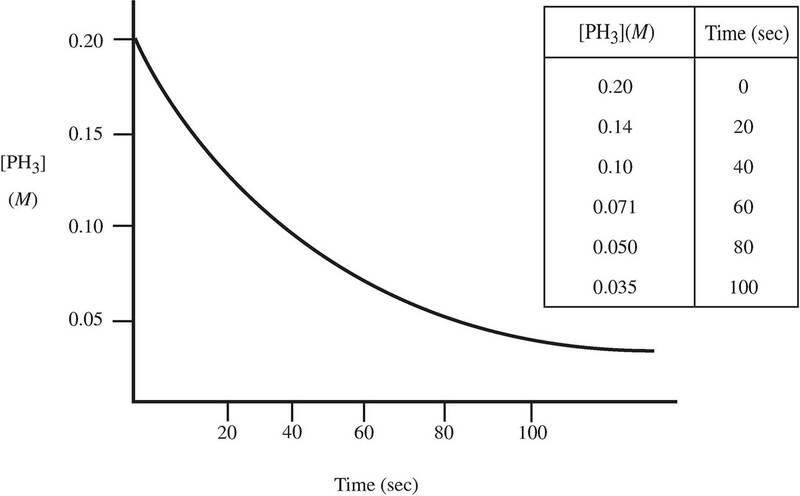 (ii) What would the concentration of the PH3 gas be after 120 sec? (i) What is the rate of appearance of P4 at the same point in time? (ii) How will the rate of appearance of P4 change as the reaction progresses forward? (c) The experiment is repeated with the same initial concentration of phosphine, but this time the temperature is set at 500 K. How and why would the following values change, if at all? The reaction above is second order with respect to A and zero order with respect to B. Reactants A and B are present in a closed container. Predict how each of the following changes to the reaction system will affect the rate and rate constant, and explain why. (a) More gas A is added to the container. (b) More gas B is added to the container. (c) The temperature is increased. (d) An inert gas D is added to the container. (e) The volume of the container is decreased. 6. Use your knowledge of kinetics to answer the following questions. Justify your answers. The two lines in the diagram above show different reaction pathways for the same reaction. Which of the two lines shows the reaction when a catalyst has been added? 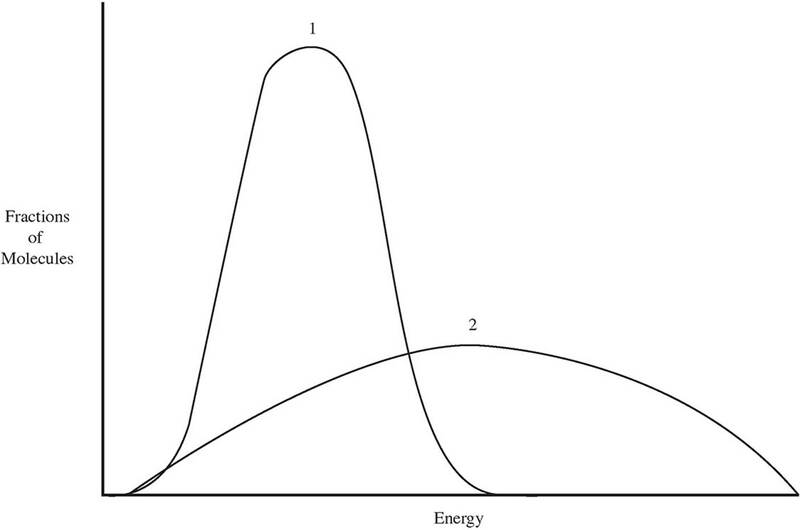 Which of the two lines in the energy distribution diagram shows the conditions at a higher temperature? 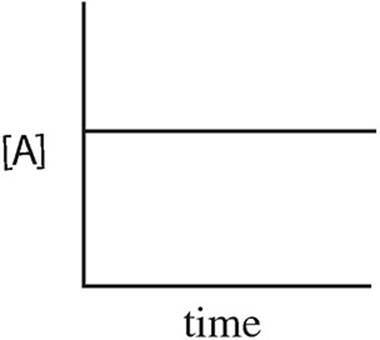 Which of the two lines in the diagram above shows the relationship of ln[A] to time for a first order reaction with the following rate law? 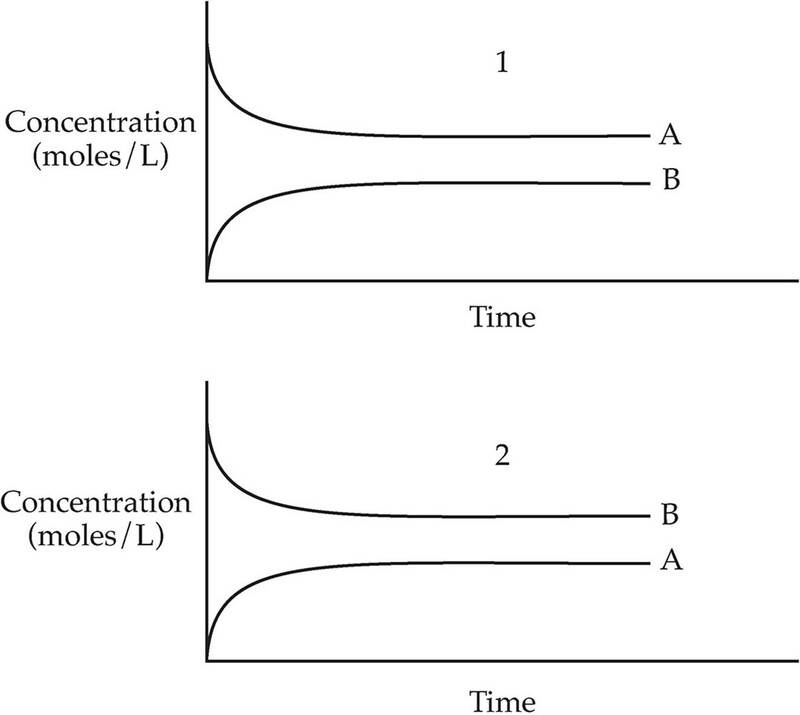 Which of the two graphs above shows the changes in concentration over time for the following reaction? 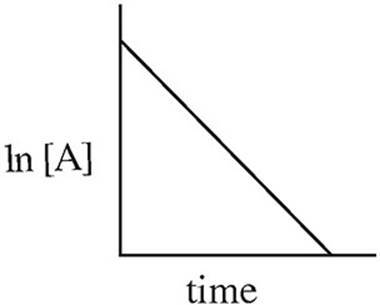 (a) An increase in the temperature at which a reaction takes place causes an increase in reaction rate. (b) The addition of a catalyst increases the rate at which a reaction will take place. (c) A catalyst that has been ground into powder will be more effective than a solid block of the same catalyst. (d) Increasing the concentration of reactants increases the rate of a reaction. (a) (i) What is the rate of disappearance for crystal violet from t = 60 s to t = 120 s? (ii) If the solution placed in the spectrophotometer 30 s after mixing instead of immediately after mixing, how would that affect the calculated rate of disappearance for crystal violet in part (i)? (b) Given the path length of the cuvette is 1.00 cm and the molar absorptivity of the solution is 26,000 cm/M at the wavelength of the spectrophotometer, what would the absorbance reading on the spectrophotometer be at t = 60 s? (c) This reaction is known to be first order with respect to crystal violet. 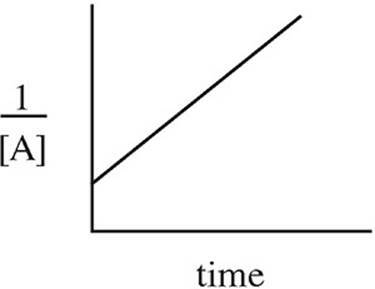 On the provided axes, graph a function of [CV+] vs. time that will provide you with a straight line graph. (d) Write the rate law for this reaction. (e) What is the rate constant, k, for this reaction? Include units in your answer. (f) Determine the initial rate of formation of CVOH for trial 3.